Andy’s crew! Showed up at the appropriate time, worked fast and were extremely careful with all our belongings taking time to wrap things up awesome so they wouldn’t be damaged in the transport. All had great attitudes, work ethics, and made a long day of moving enjoyable. Do not look any further if you need movers as they will do a fantastic job and are priced very competitively! We don’t plan on moving for a long time!! Lol! But if the time comes we will be calling Northstar Movers again!! Movers were great! On time! Great service! Will definitely used again! Jimmy Jonathan & Eddie….great service! These guys were A+ got our move done on time, made it easy! They were troopers! We’d estimated 5 hrs and they were able to complete the move in our estimated time! Every aspect of my experience with North Star Movers has been stellar and way beyond my expectations. 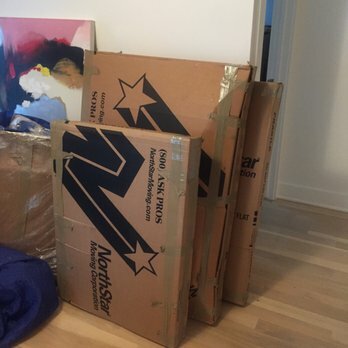 I requested rates from 6 other movers and North Star gave me the most competitive rates. Stephanie (and everyone really) from their Client Loyalty Team was so friendly and helpful. She accommodated us so much for our move. These guys did a great job moving my stuff from storage to my new place in the pouring rain! I was worried about my things getting damaged because of the horrible weather but everything was in perfect condition. The movers were also super quick to get everything in despite the rain and unusually cold weather. They arrived on time and were very friendly. Most movers would probably be in a bad mood moving in this weather and having to hike up a steep hill but they were in good spirits and in a good mood. I’ll never try to do a move on my own again! I highly recommend northstar in Chatsworth for both moving and storage. Five stars! Satisfied customer! Today was moving day! My fiancé and I have been tirelessly renovating our new home and the thought of having to deal with the actual move was daunting. We have big items like flat screen TVs, couches, computer and desk, beds, dining table, chairs, etc on top of the numerous boxes of stuff that require heavy lifting and careful packaging. We called NorthStar as returning customers and they were so professional and easy to make an appointment with. Brandon, Randy and Andy arrived on time with friendly attitudes this morning and totally ready to get to work. They were diligent in taking care of our belongings and made sure to wrap and transport every item in tact. Their thoroughness, collaboration with one another, friendly demeanors and ability to get work done with haste made this moving day a complete breeze. We highly recommend this company to all of our friends – we had a great experience the first time and this experience just solidified the fact that this should be everyone’s go-to company for moving. Andy and his team have been more than fantastic! Scheduling was amazing and they were very accommodating. He recognized I needed the help and if I had to move I would use them in a heart bit. The 3 guys were very nice and easy to work with. They took excellent care of all our things and wrapped everything. They even helped me with things I didn’t think about like the water cooler. The paperwork was a breeze and they used excellent materials. I loved the free wardrobe service for the closets. They were also amazing in installing all of our beds and putting all the things were they belonged. I loved their attitude and all their hard work! Thank you so very much! We are more than happy with all your super hard work! Our team of movers did an EXCELLENT job! Andy’s crew were very efficient and hard-working. This is our 3rd time using Northstar and there is a reason we keep coming back. Great customer service and a timely and efficient move. Getting it done right the first time is so valuable! They showed up on time and got working quickly. Very very friendly eat easy to schedule. We used their free estimator Ron, and he was excellent. My family will definitely use them again. I highly recommend Northstar for your moving needs! NorthStar was our first choice for a local move. I had already had a very good experience with them years ago for an in-state move and wasn’t interested in dealing with a sketchy company. We opted to pack everything ourselves and have NorthStar move our things by truck. However, they do offer options like having them pack stuff up. We purchased most of our packing supplies from Home Depot or Amazon. Just about everything from Ron’s free estimate at our place to the actual move by Ramiro and his team was done with the utmost professionalism and fortunately we had no major incidents with the move. They were careful and responsive. During the estimate, Ron let me know that I was probably underestimating how much stuff we had (he was right, leave it to the professionals). Ramiro and his team moved quickly and communicated effectively. Our priority was in getting our stuff moved safely by a reliable, professional company. In that regard they succeeded, which is why I’m writing this review. Great moving experience. The movers worked quickly and helped us disassemble some items when necessary. Would highly recommend! My move was from Toluca Lake to Culver City. Could have been a major pain, but turned out really well. I would definitely hire NorthStar to move my belongings again. They even managed to get to my new place really quickly on a rainy day– not easy to do with LA traffic. We moved from Santa Clarita to Agoura hills and it was really easy. The movers came right on time and packed up everything for a “do not exceed” rate meaning we pay for what we were quoted and if we went under the time, we wouldn’t be charged for that extra time even though it was quoted. I think that was the best part and I was always able to call the office to add or remove items/insurance for the move. They offer .60 cents a pound of insurance and I bought extra insurance for the valuable items. The price was fairly reasonable to insure $5000 worth of items. The movers were really kind and there was a lot of traffic, but they called me to let me know what was going on our drive over. I really like that they were responsible with our time. They packed everything really well and we didn’t have anything break on us which was amazing. Really happy! I would definitely recommend them again.